This is a brief description of the three bedroom, three bath, ocean front, penthouse units. For up to date availability, return to the previous page and go to Search Rentals, input your dates and select Seaside under location, then click Check Availability. 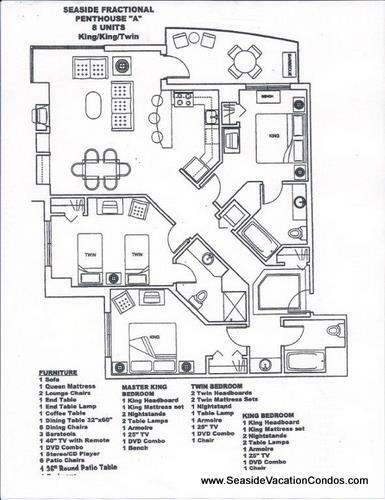 The penthouse units are located on multiple floors of The Resort and are luxuriously appointed. These condos are approximately 1350 square feet and offer spectacular views of the coastline from Tillamook Head to Washington State. The units are limited to 6 guests and offer a complete kitchen, living and dining room, fireplace, balcony and jetted tub. They are furnished with a king, queen, and two twin beds. Unlike the other units, these do not have the Murphy bed in the living area.